Its report is based on a study of Chinese travel to the European Union (EU) countries undertaken by ForwardKeys, which monitors over 17 million flight booking transactions a day. For the first eight months of 2018, Chinese arrivals in the EU were 4.0% up on the same period in 2017. Growth in the first four months was up by 9.5% and in the second four months, up by 2.2%. 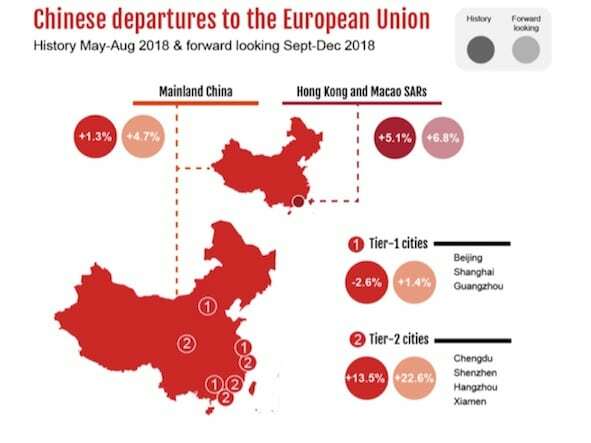 Looking forward to the last four months of the year, Chinese bookings to the EU are currently 4.7% ahead of where they were at the same point last year. This is a relatively encouraging position, since outbound bookings from China to the rest of the world are currently 3.6% ahead. When analyzing source cities, it is apparent that the recent growth is coming from the Hong Kong and Macao SARs and tier-2 Chinese cities. During May-August, growth from Hong Kong and Macao was 5.1%, while arrivals growth from Chengdu, Hangzhou, Shenzhen and Xiamen was 13.5%. The outlook for the remainder of the year is similar but amplified. Bookings from the tier-2 cities are 22.6% ahead of where they were at the same point last year; bookings from Hong Kong and Macao are 6.8% ahead and bookings from the tier-1 cities are just 1.4% ahead. 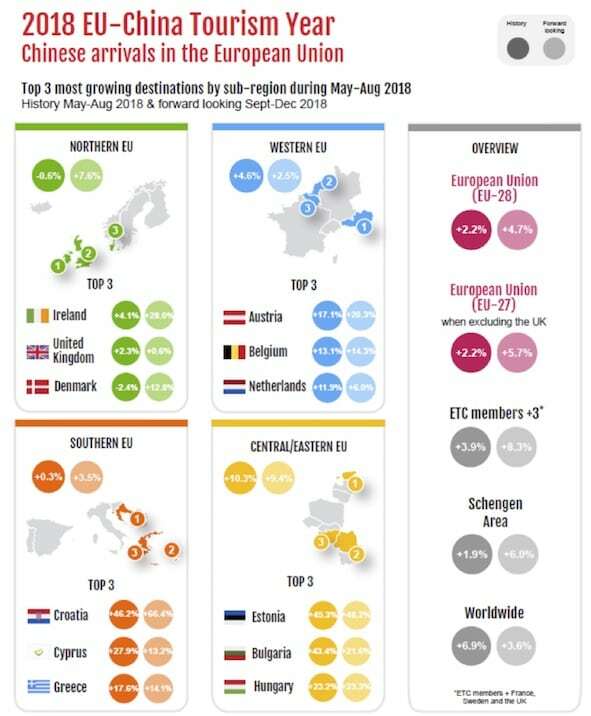 Different parts of the EU are growing in terms of Chinese visitors at very different rates, with the stand-out sub-region being Central/Eastern EU. Over the second third of the year (May-August), Chinese arrivals in Central/Eastern EU were 10.3% up on 2017 and the outlook until the end of December, based on current bookings is 9.4% ahead. As one of the objectives for the EU-China Tourism Year included the promotion of lesser-known destinations, these numbers indicate the further success of the initiative. Top performers in the region were Estonia and Bulgaria, with increases in Chinese arrivals of 45.3% and 43.4% respectively. The outlook until the end of the year is encouraging for both destinations, with bookings ahead 48.2% and 21.6% respectively. By contrast, arrivals in Northern EU, during the second third of the year, were disappointing -0.6% down on 2017. The least optimistic outlook for the last four months of the year is currently for Western EU, where Chinese bookings are 2.5% ahead of where they were at the equivalent moment in 2017. The star performer in the Southern EU is Croatia. Chinese arrivals in May-August were up 46.2% and the outlook for September-December, based on current bookings, is 66.4% ahead. An analysis of future travel reveals that the outlook, in terms of Chinese bookings to the UK for the last four months of the year, is just 0.6% ahead of where it was last year. Consequently, if the UK were to be excluded from the figures, Chinese travel bookings to the EU would be 5.7% ahead rather than 4.7% ahead, which is the figure for the EU as a whole. Two important festivities for Chinese outbound travel this year are China’s Mid-Autumn Festival and the National Day Golden Week (18 September to 8 October). 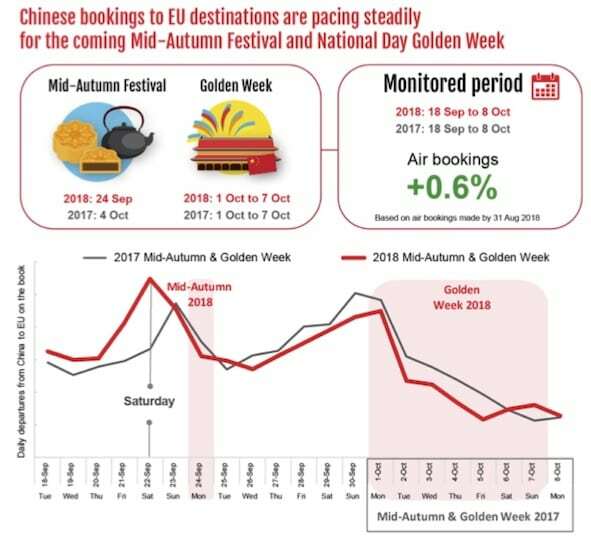 Currently, Chinese bookings to the EU are 0.6% ahead of where they were for the equivalent period last year, which does not sound particularly exciting; however, considering that Chinese outbound bookings to other long-haul destinations are 3.6% behind, the EU seems to be performing relatively well. The best performing EU destinations during this period are set to be Sweden, 26.3% ahead, Austria, 13.1% ahead and the Netherlands, 8.7% ahead. 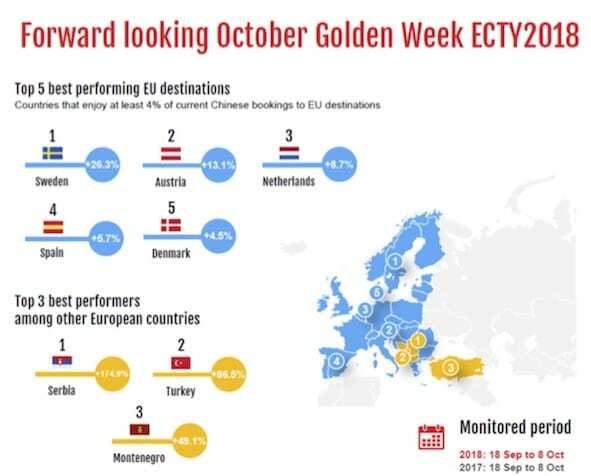 The stand-out non-EU destinations during October Golden Week are Serbia, Turkey, and Montenegro, where current bookings are ahead 174.9%, 86.5% and 49.1% respectively.